John Kay plays a special show for Rickenbacker dealers. hn Kay and his band Steppenwolf performed before a "standing room only" crowd at a show held recently for the benefit of Rickenbacker's best dealers. 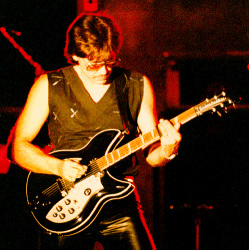 Featured in Kay's performance was the John Kay Limited Edition Rickenbacker and the sound which brought Steppenwolf to prominence as one of the giants of rock and roll. The sound that decreed he was "born to be wild" is incorporated in the new model 38IJK which is the modern equivalent to the guitar Kay used in his early Steppenwolf days. To add to the powerful style which distinguishes John Kay from lesser musicians, this model was designed with several timely updates including active electronics and special John Kay Model extras. These include Rickenbacker's newly designed humbucking pickup, active and passive modes, lead phase switch and a four position rotary switch which provides for many different combinations of single coil and humbucking pickup configurations. The John Kay 381 also offers stereo and monaural outputs a customized exterior with silver pick guard, silver nameplate and jet glow finish. Only 250 of these instruments were manufactured practically ensuring the result that this model will become a collector's item for the discerning guitar buff in the ensuing years. Each guitar was accompanied by a numbered certificate of authenticity signed by John Kay. John Kay, a rock and roll rebel, lately proved to an audience full of loyal fanatics that classic rock stars never fade away: they just become legends in the annals of rock history as do the guitars they play.